Back in January of last year, Sister Mag organized an event for Coca Cola where I made fashion illustrations of the guests. One of them was Ruth Garthe, a fashion and lifestyle blogger from Mannheim. She put in a good word for me with the fashion label Madeleine, so when they organised a charity event at Tribute to Bambi Awards, they commissioned me to live sketch for them. 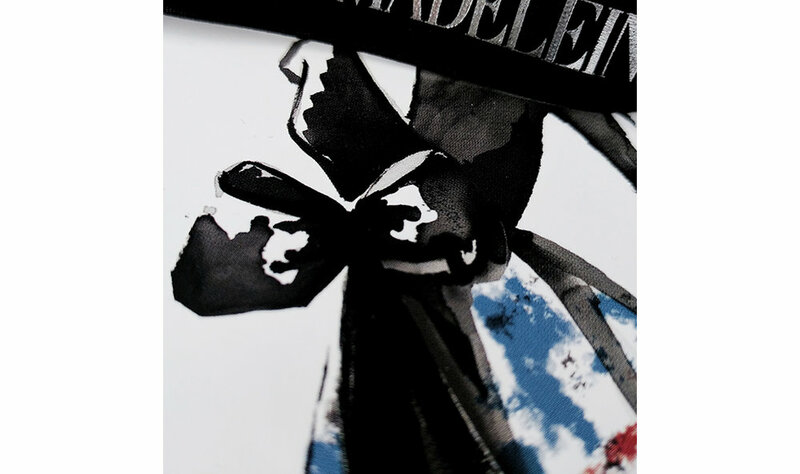 Now, Madeleine is turning 40, and to celebrate it they are bringing a whole collection of elegant garments to the market, highlighted by a precious anniversary dress. In addition to it, they are creating promotional material including brand stationery and once more commissioned me to help them with it. I was thrilled to team up with them again and designed the above greeting card that Madeleine's clients and contacts will be receiving throughout 2018.